It has been a busy few months and I have gradually been producing some new pieces of work. I am currently working on my Melbourne paintings, as well as following the Tigers with some smaller A3 works (I will write about these in a separate post) and trying to slot in a few commissions here and there. With my studio located about 14 km out of Melbournes CBD in the suburb of Glen Huntly, I am working with the local environment as my source of motivation to create. I started with my Melbourne works ten years ago looking at some of Melbourne's more iconic places. More recently have confined my subject to the street life within the Glen Eira municipality. 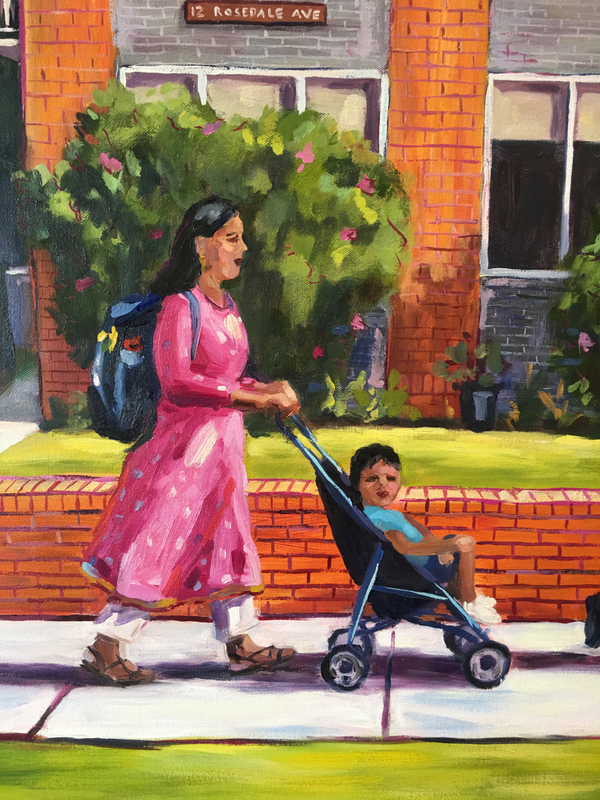 I began with some of the urban portraits I did of local people with at work, kids coming home from school and some of the local tradesmen I was acquainted with. This year I have zoomed out a bit and have been looking for everyday moments, vignettes of fleeting transactions between the people on our streets. I am finding this is a great way to work and in having a studio right on a main road, in a shopping strip, I need only to step outside and take a wander in order to find my subjects, ideas and inspiration. I have lived in this area for almost 20 years and I am seeing a constant shift and evolution in the way my suburb looks, lives and behaves. The suburb has seen some big changes with the demolition of large homes giving way to apartment blocks. This of course, not being anything new; a short stroll through the streets will show you that such development clearly took place back in the late 1950's and 1960's. Like many suburbs within a 15 Km radius of the city, Glen Huntly (and the neighbouring suburb of Carnegie) is loosing the classic family homes that once characterised the suburb. Large Californian Bungalows and Edwardian homes along with their sizeable backyards are literally disappearing from our streetscape. More people are living in smaller homes, apartments or flats and often with little outdoor space. And so I find it really interesting to watch and observe the rich cultural variety of day to day life that unfolds upon the pavements and footpaths of the suburb. My perspective is often from my drivers side seat as I sit out the often protracted time spent with the boom gates down at the Glen Huntly Rd. level crossing, as well as that of a pedestrian and a local resident. I recently read an article describing Glen Huntly as grotty and sleepy. Yes, it certainly needs cleaning up in places but I do challenge the notion that perhaps our suburb has little to offer. If you would like to share your thoughts on our suburb Glen Huntly please do...with respect, naturally, leave a comment, memory or opinion. This is this piece I have done for this the first Womens Footy Almanac 2017. It has been more than a while since I last sat at the computer to write anything at all. I have been fairly well buried plying my trade in the studio with my mind fully focused on whatever piece it is I have been working on. One of which was of course the cover art painting I did for this year’ first ever Women’s Footy Almanac 2017. While I knew the Almanac writers were busy documenting and crafting their words to share and capture the many feelings and experiences of this first season I was caught a bit when I realised the Almanac team were publishing and looking for an image for the cover so early in the year. Working with John and Yvette a conversation began through which I was able to absorb a few ideas and thoughts and then allow them to cure in my mind so that I could pull together an image that was authentic and real to not just the prospective audience, but to me. My initial thoughts and sketches began with the first bounce of the first game. Whilst there is nothing right or wrong with this idea, it was simply that, an idea that when given a little time, was able to formulate into what it eventually became. The first AFL women’s season was more than the first bounce. The season itself was shared and played out across the country and invited into its realm a real breadth of personality and character. A sense of place was noticeable in many of the games, with backdrops ranging from suburbia, to bush and magnificent sunsets in Darwin. Many of the venues were open spaces, with tiered terraces, older styled grandstands, visible horizons and vast skies. A refreshing image that gave footy fans a break from the largesse of the big stadia and recalls games I attended in my own youth creating a sense of familiarity to me. With these thoughts in mind the painting evolved. Sabrina Frederick-Traub and Erin Phillips were depicted for their ability on the field and as representatives of the two teams that made it to the grand final. I needed a third figure to bridge the two women. I was not inclined to paint a generic ten year old. I needed to paint someone I had a link with and so I asked Jasmine if she would like to be the subject in my painting. Jasmine plays with the Caulfield Bears in the first ever girls Under 12 team. I have had my own kids playing with the Bears since 2003. It has been a terrific club that embraces its local community, offering and widening social connections and a sense of belonging, and now it celebrates our footy loving girls too….out with the raffle tickets and in with the awards. Jasmine represents all young girls looking ahead, looking towards the future with hope and opportunity. 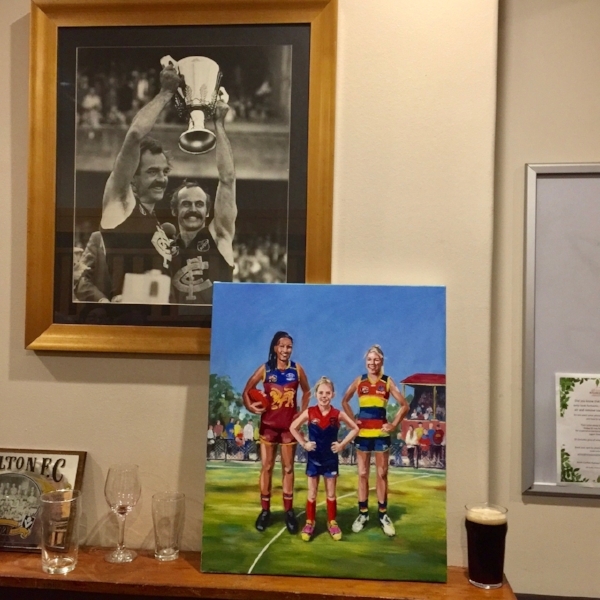 It was great to be a part of the Women’s Footy Almanac 2017, absolutely terrific, and I did have a chuckle seeing David’s photo of my painting on the mantelpiece at the North Fitzroy Arms Hotel alongside Percy and Jezza, and of course David’s pint. At Jasmine’s age Percy and Jezza were my heroes. I think if I was to ask Jasmine who her heroes are, I am fairly certain Daisy Pearce could be No.1. And at Jasmine’s age, I could not have thought back then that I would be painting an image of three women celebrating the first season of AFL Women’s league. And, like wise who would have thought so many years on that I would be a Dusty lovin Tiger fan…sorry Percy. I drew my first footballer way back in my teen years. It was of one of my younger brothers playing a game on his own in the backyard. Our back yard was a few blocks from Windy Hill. My brother commentated as he kicked, and he roared as though there was a crowd of 99,000. Of, course there was not. Not even at Windy Hill, was there ever a crowd of 99,000. There was only me, with pen and paper in hand. I was keen to see if I could draw a moving figure. And so I tried. Since then I have explored footy as a subject through my art and through my painting. These paintings form part of a collection of work that I have done since the start of the 2016 finals. It is the first time I have used a grand final as a theme to inspire my work. The Doggies win against the Swans was an uplifting experience for all; not just mad keen footy fans, but for those too, who claim proudly to 'know nothing about footy'. From the depths of despair at having such a long span between the glory of only one ever premiership cup, the anticipation of having reached finals and the unlikely chance of charging up through the final series to make it to the big day, was...well, such an unlikely story. Being a tiger fan, I was able to take it in, unencumbered, from the periphery, going into to the city on the night of the Hawthorn final to sketch the grandiose stream of people walking to the G, anticipating all the possibilities of the Sydney/GWS trek, absorbing the atmosphere of the red, blue and white Scray landscape in the days before the granny, to the finality and joy of the big day. 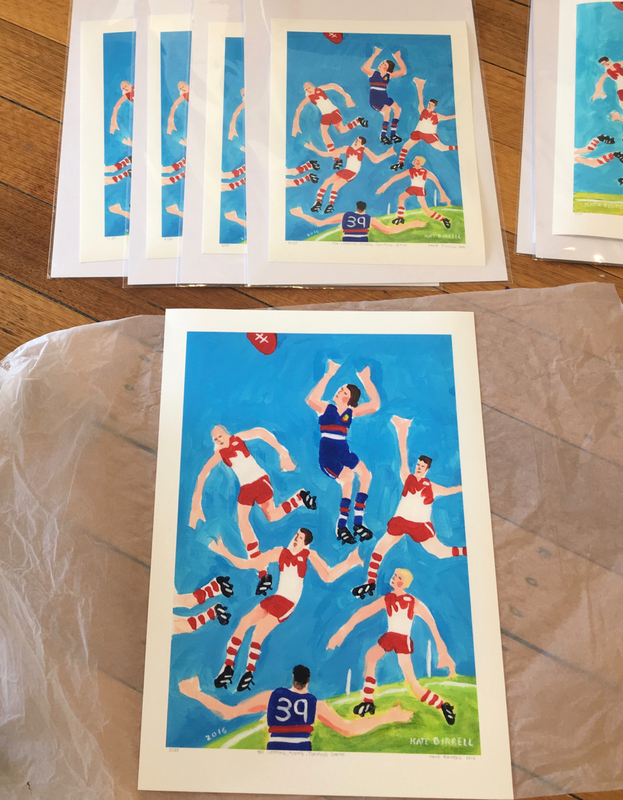 These paintings focus on the footy family, any family, any nationality, any age, any gender, the concern and the weight of possibilities as they charge forth to the final game of the season. My families are portrayed at the station, waiting and wondering and hoping the win will be theirs only. And with this long awaited premiership victory, there came the drenching sense of joy. To me the intensity of those feelings is perhaps, at a contained peak upon the drive home for those who attend any such sporting game and for those supporters in the days, weeks…...and sometimes months, afterwards. The statement made by hanging ones' team scarf out the car window, is the one simple gesture that epitomises a sporting celebration and for the Western Bulldog fans, the grand celebration that was the 2016 season. ....with the ingredients for Mary's Chocolate Brownies. My trials with simpler compositions and flatter colours has continued. I have moved back to the stretched canvas's and oils after exploring the many and various possibilities with acrylic paint on paper. The acrylics do have some advantages over the use of oils especially where drying time is concerned. For me they work well in smaller works on paper, but they don't appeal to me for use in larger works. The very feel of oil paint moving across a freshly primed canvas still seems luxurious by comparison to acrylic paint. It allows for subtleties of tone and texture that are not as evident in acrylic, as it dries too quickly to be able to work into the paint at later stages. Impasto areas of acrylics also seem a little too plastic for my liking whereas oil paint often maintains a natural lustre and sheen that create their own stories within the surface of the medium. Domestic Scene with the Ingredients for Mary's Chocolate Brownies is the last in a small series of domestic scenes on canvas measuring 60cmW x 50cmH. My next plan is to take what I have been doing here and hopefully apply to some new and larger figurative works on canvas. Grease 25cm square baking dish, and preheat oven to 180 degrees. Melt chocolate and butter together over a double saucepan. Remove from stove and stir in sugar, vanilla, eggs, flour and nuts. Stir until mixture just comes together. Pour into baking dish and level off. Bake until the mixture is set but not dry, about 25 minutes. DON'T OVERCOOK.......the top should be soft to touch, the brownies will firm as they cool but should remain moist and fudgy. Cool in the pan and then cut into squares. *Serve after school with a chocolate milkshake and a plate of fruit. It is Monday the 6th of March. I'm at home. I have had a good break from the desktop over the holidays. So here I am cleaning up 99 unread emails, paying bills and booking seats to the Richmond v Carlton game on the 23rd March. After having worked on the smaller A4 acrylic pieces it has been good to go back to using oil on canvas. The acrylics are great for speed and quick drying time. They are a great back up if I am stuck at home due to school holidays or sickness. The acrylics are bright and vibrant and work really well when diluted with a medium. Given they are on paper they frame up well in either a simple black or white frame. The oils on the other hand are much slower to work with in terms of drying time but this can be beneficial in that compositions can be changed and altered and scraped back as required. The oils also have a capacity that enables you to work into them and build upon layers that can become quite sculptural, and almost velvet like in texture and lustre. For a while now I have been wanting to paint in a way that is less dependant on either what I see directly in front of me, or on a reference photograph. So, I began by going back to my domestic scenes that I began with years ago and have worked at bringing in a newer approach that incorporates memory and imagination too, and a method that is hopefully freer and less academic in style. Domestic Scene with the new Kitchen Aid above is the very first one I did. I have taken a similar approach with my bulldog footy images too, where the reality is diminished, the colours have been heightened and flattened; and the emphasis is on both narrative and expression. We shall see how this progresses throughout the year. It is a process, undoubtedly. Back soon, it's time for cake. After a series of pen and ink and watercolour works that I did earlier in 2016, I have explored the seaside theme further by using the sketches (image below) to form the basis of a collection of small paintings. Visit the Yamba 2016/17 Gallery to view the images. Things are a bit all over the place. I participated in the Cityscape en plain air painting day with the Glen Eira Artists Society earlier this month. I found a spot at the back of the chemist that fronts on to Glen Huntly Rd. Tucked away it was, but I was able to park my car and not have to lug stuff too far. The weather was excellent. Warm and sunny with some shade. The Elsternwick Traders put on a mini carnival down in the newly designed Elsternwick plaza so there was a great response and atmosphere on what was a leisurely Sunday afternoon. I did a quick ink sketch to familiarise myself with the important elements of the composition; sketched up in chalk, a layer of thin paint to block in certain colour areas and then a finale of thicker paint applied quickly, in part because my back was sore, and in part to capture the sunlight and its shadows before they shifted. I spent about 2 -3 hours between set up and pack up on the piece. It was covered insects at the end, attracted to the yellows, I think. Exhibition: Cityscape currently on in the Annexe gallery at Glen Eira Town Hall, Glen Eira Rd, Caulfield.